The commercial provisions of the South Carolina Energy Standard reference the 2009 IECC, including that code’s reference to ASHRAE 90.1-2007 as an alternative compliance path. Both the residential and commercial code are mandatory statewide. All new and renovated buildings and additions constructed within the state must comply with this standard. Local jurisdictions may adopt more stringent codes. The 2006 IECC was adopted by the SC Legislature as the minimum standard for compliance with the State Energy Standard, thus removing it from the normal adoption process. The legislature updated the energy code to the 2009 IECC during the 2012 legislative session (Act 143). Future updated versions must also be adopted by statutory amendment. 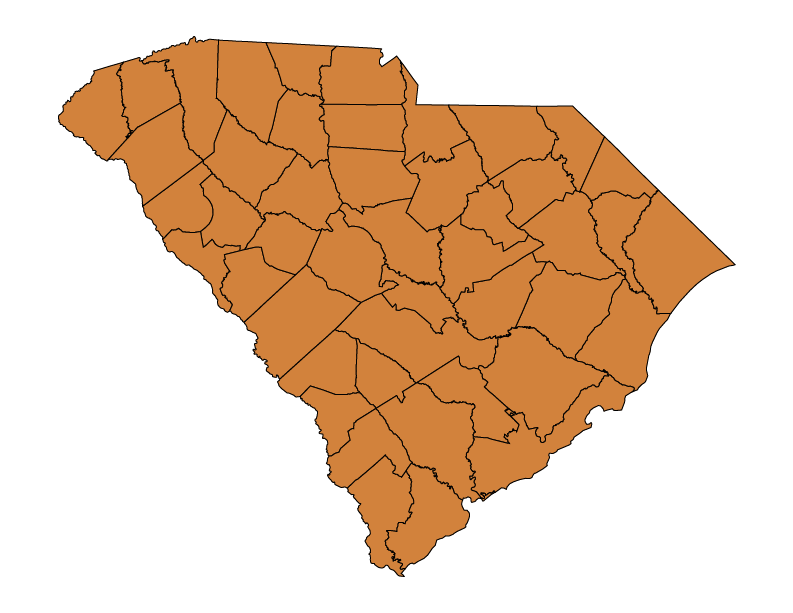 Regulatory and Legislative Process: While the South Carolina Building Codes Council (BCC) is charged with adopting and amending most statewide construction codes, including the IRC and IBC, the ultimate authority to adopt and update the South Carolina Energy Standard is left to the South Carolina General Assembly. A group of technical experts and other stakeholders comprises the Energy Advisory Council (EAC), which is part of the South Carolina Public Utility Review Commission (PURC). The EAC reviews code proposals and develops amendments which it may recommend to the PURC. Should the full Commission approve the proposals, they are then submitted to the Public Utility Review Committee of the South Carolina General Assembly, where legislative language is drafted and the bill then proceeds through regular legislative order. If passed into law, a code update will generally become effective on the first day of January or July, whichever date is sooner but not less than six months from the adoption date of the new code. The 2015 I-codes with state-specific modifications become effective statewide. The energy code has not been updated and still references the 2009 IECC. The House approves HB 4639 on February 23rd, and the Senate concurs on March 21st. Gov. Nikki Haley signs the bill into law as Act 143 on April 2, 2012. This act amends Section 6-10-30 of the state’s code of laws as to adopt the 2009 IECC as the statewide energy standard. The effective date of this legislation will be January 1, 2013. The residential provisions of the South Carolina Energy Standard (2013) will reference the 2009 IECC. The commercial provisions of this standard will reference the 2009 IECC, including that code’s reference to ASHRAE Standard 90.1-2007 as an alternative compliance path. The state takes a major step forward for building energy efficiency by adopting a significant update to the state’s building energy code. In late 2011, the proposed update won approval by the state Energy Advisory Council (EAC) of the Public Utility Review Committee of the South Carolina Legislature. In January 2012, the South Carolina Legislature introduces legislation to update the South Carolina Energy Standard to reference the 2009 IECC (it currently references the 2006 IECC). The South Carolina Home Builders Association speaks in favor of the bill during the committee process. The South Carolina Building Code Council has also begun to review of the 2012 family of I-codes. Investigation and analysis by Mathis Consulting Company for the 2012 IECC for South Carolina showed cost effective and significant energy and peak power benefits to the state. The South Carolina Building Codes Council moves to form an International Green Construction Code (IgCC) study committee, which will consist of volunteers to meet and discuss the merits of adopting of the IgCC as a permissive code. The committee plans to present its findings to the full Council. Due to recent statutory amendments to the building code adoption process, the South Carolina Building Codes Council announces that the 2009 International Building, Fire, Residential, Plumbing, Mechanical and Fuel Gas Codes will not be implemented on January 1, 2011 as previously announced on March 30th. To comply with the new statutory requirements, the regulatory portion of the code adoption process must be repeated. The new regulatory procedure is not as predictable as the prior procedure; therefore, the implementation date for the 2009 I-Codes will be determined at a later time. The state’s energy efficiency standard will continue to be the 2006 IECC, which has been in effect in its unamended form since July 1, 2009. Then-Gov. Mark Sanford signs legislation (HB 3550) which mandates the 2006 IECC for all new construction, renovated buildings, and additions effective July 1, 2009. Local jurisdictions may adopt more stringent codes. Local building officials are required to enforce the new standards, and alternate enforcers are provided in areas that do not have building code officials. The residential provisions of the South Carolina Energy Standard reference the 2006 IECC. The commercial provisions of the South Carolina Energy Standard reference the 2006 IECC, including that code’s reference to ASHRAE Standard 90.1-2004 as an alternative compliance path. South Carolina completes its Climate Action Plan final report, which includes recommendations regarding the improved design and construction of new and renovated buildings. The South Carolina Building Code Council (BCC) formally adopts the 2006 IECC for non-residential buildings and 2006 IRC for residential buildings. Due to the statuary process for code adoption, the 2006 IECC is officially implemented in South Carolina on July 1, 2008, but implementation of the 2006 IRC is postponed until July 1, 2009. Previous adoptions of energy codes in South Carolina were the 2000 IECC on May 24, 2000 (effective July 1, 2001) and the 2003 IECC on May 26, 2004 (effective January 1, 2005). Governor Sanford issues an executive order that creates the South Carolina Climate, Energy and Commerce Advisory Committee (CECAC). With assistance from the Center for Climate Strategies, CECAC is charged with investigating strategies and reporting final recommendations to the governor.